Did you resolve to spend more time outside in 2018? We’ve got the perfect way for you to achieve your resolution! Join us July 8-15 for Parks & Trails New York’s 20th annual Cycle the Erie Canal tour. The tour offers an unparalleled opportunity to experience great cycling while taking in the rich history of the legendary canal that helped transform America.. The tour offers an unparalleled opportunity to experience great cycling while taking in the rich history of the legendary canal that helped transform America. Sign up today to join over 600 cyclists ride across New York this summer along the historic Erie Canal, which is celebrating its 200th birthday this year. 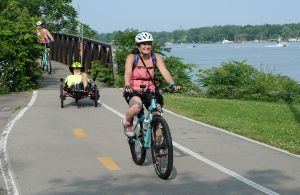 This year, the Cycle the Erie Canal tour offers: 2-Day and 4-Day Options: You can still enjoy a cycling adventure even if you can’t make the entire 8-day trip. Weekend and 4-day options allow you to fit a world class cycling experience into your busy schedule. These shorter options are great for families as well. Return Shuttle: Riders from Buffalo, Pittsburgh, Toronto, and points west will be happy to hear we’ll once again be offering our return shuttle from Albany to Buffalo at the end of the ride to make your vacation relaxing and worry free from start to finish. Erie Canal Trailblazers: Interested in cycling the whole tour for only $100? Become a Cycle the Erie Canal Trailblazer and help PTNY promote the Erie Canalway Trail and bicycle tourism! Registration includes a free Cycle the Erie Canal Trailblazer jersey and guidebook and special recognition on the tour. Learn more. If you have any questions about Cycle the Erie Canal, call Parks & Trails New York at 518-434-1583 or email eriecanaltour@ptny.org. Also, check out our Cycle the Erie Canal website to learn more about all the Erie Canalway Trail has to offer.